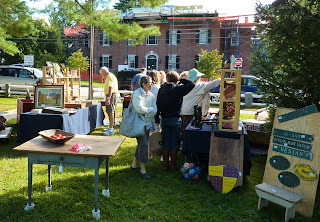 After several days of inclement weather, Saturday, 14 September 2013 dawned clear and cool for our 18th Annual Antiques on the Green event. As the day progressed though clouds moved in and the temperature dropped a few degrees; but none of the nearly 700 who visited lacked enthusiasm for a wonderful gathering of antiques in this very historic setting. 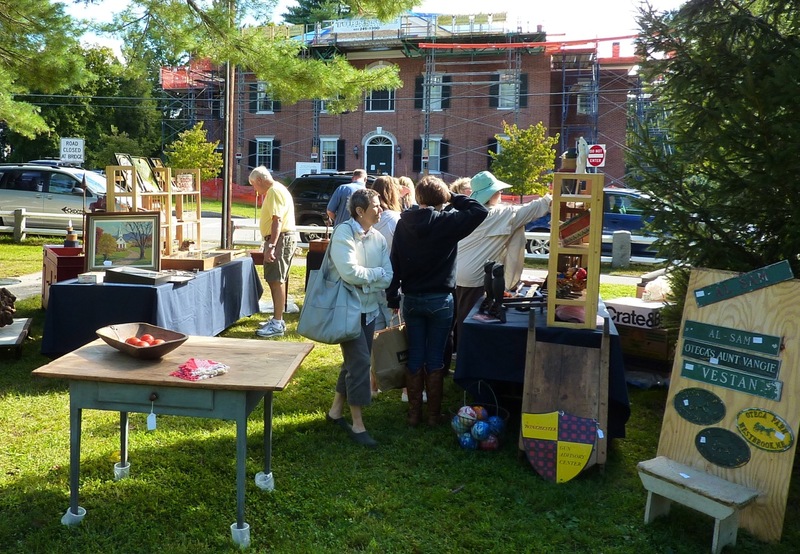 Vendors on the east end of the Common by the Town Hall or the third Hillsborough County Courthouse built in 1825. Behind this building is New Hampshire's oldest public cemetery established in 1735. Just to the right out of view is the Means Mansion, where Franklin Pierce (14th President of the US) married Jane Appleton Means in 1834. Any successful antique show must attract an oriental or Persian rug vendor and we enjoyed a peddler with an interesting display. 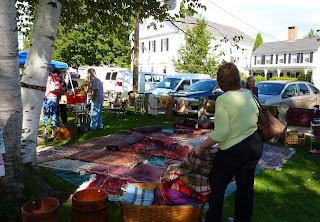 To be an antique a Persian rug must be 80 years old and there were several of those on hand last Saturday. 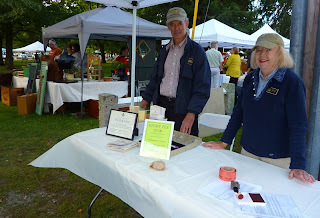 The Congregational Church entrance was manned by Don and Carol Holden. 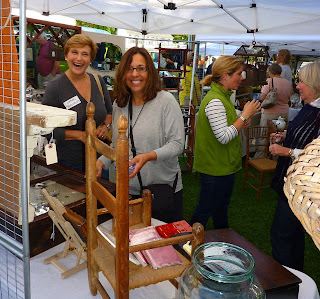 Just a few of the enthusiastic crowd who found great buys and old friends among the dealers. Music was provided on the Common by COW HAMPSHIRE FOLK, playing as they say, "old time, new time and good-time acoustic folk music." Their band members hail from Amherst, Milford, Bedford and Merrimack. 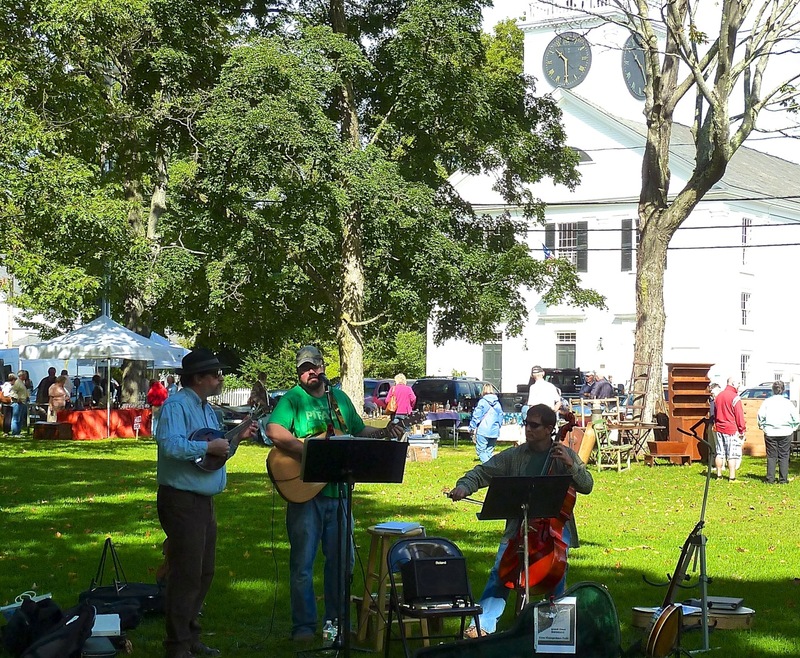 The band is standing near the spot where Sheriff Moses Kelly, on 18 July 1776, stood and read aloud to the citizens of Amherst, The Declaration of Independence authored by Virginia delegate Thomas Jefferson. John Cochran and crew from the AMHERST GARDEN CENTER AND FLOWER SHOP created a beautiful display with pumpkins, apples, annuals and other produce. 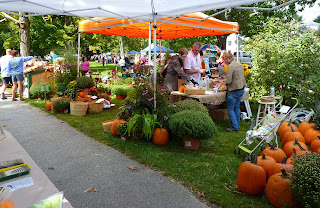 Visit their website to see all of the services that they provide at their store on Route 101 in Amherst. The pumpkins were for sale.... but not the baby! 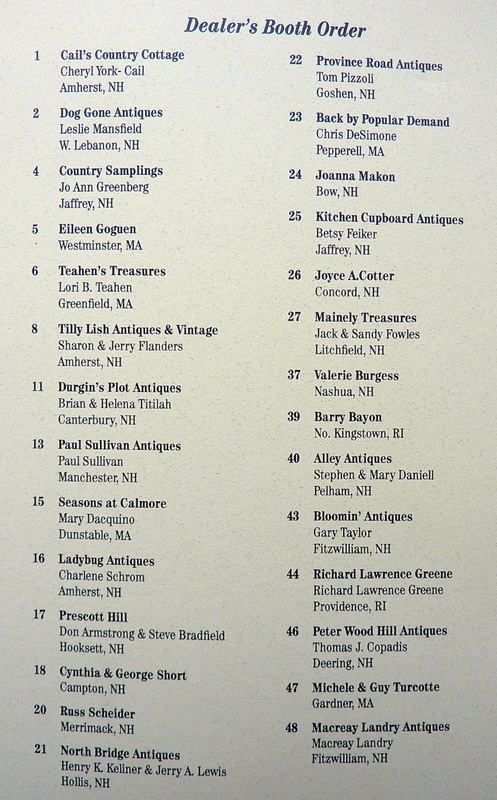 Thirty-five antique dealers from around New England enjoyed very good sales at our 18th Annual Show. 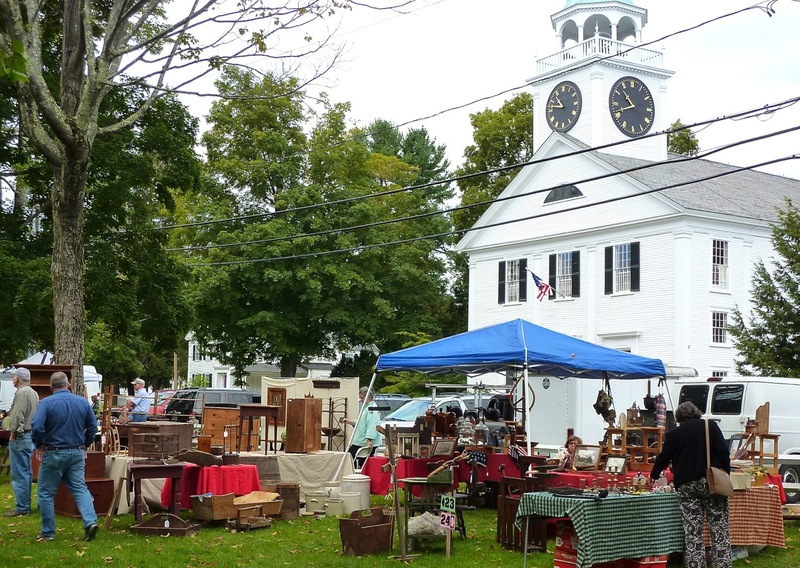 Here are just a few of those who displayed a fine variety of antiques on the north side of the Common before the Second Meetinghouse built in 1774 by Ephraim Baker. 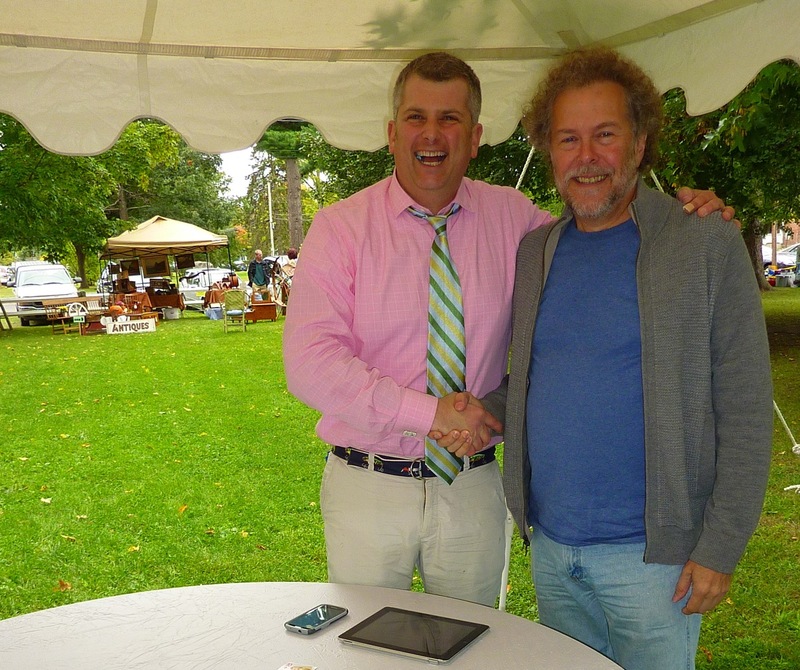 Jason Hackler from the NH ANTIQUE CO-OP and antique watch specialist David Searles were on hand to solve mysteries concerning your antiques. From "what is it?" to "how much is this worth?" they were able to help out a long line of folks with questions. 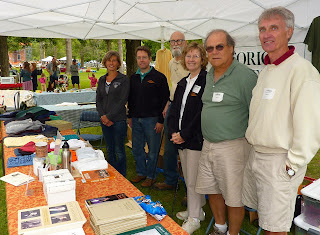 Just some of the Historical Society members on hand today to help out and insure that all went smoothly. 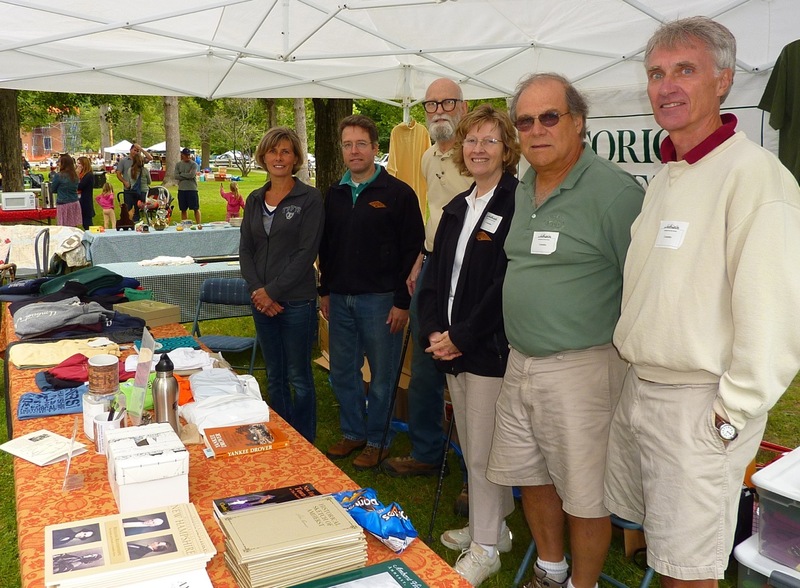 L to R Tracy and Bill Veillette, Bill Wichman, past president Janice McDermott, Rick Cricenti and current president Dave Clark, manning the Society's tent, selling books, t-shirts and other items of interest that help fund the organization. Located just a little west of the Common and past the Soldiers Monument is the Congregational Chapel built in 1858. 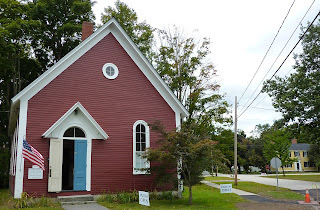 The Congregational church was unheated but the chapel was and served the congregation during the cold winter months. Its also seen duty serving the Amherst School System as temporary space while new schools were under construction. Today it serves as one of two Society museums, the other known as the Wigwam is located on Middle Street as well. Both museums are open to the public on the second Saturday of each month from May through October and house interesting and valuable items concerning our history. 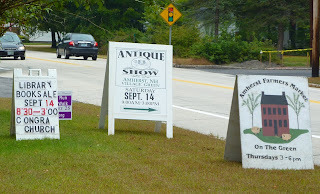 Thanks very much for taking the time to read about the Amherst NH Historical Society's ANTIQUES ON THE GREEN. A lot of work is required by a lot of people to make this the successful, southern New Hampshire antique show of the fall season. 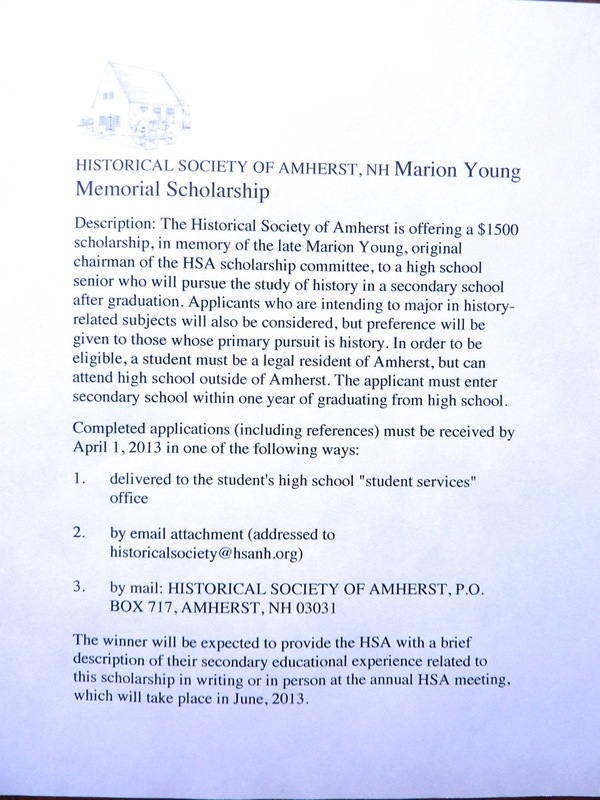 Not only is this a major fund raising event for the society, but also its greatest opportunity to fund its annual Marion Young Memorial Scholarship. 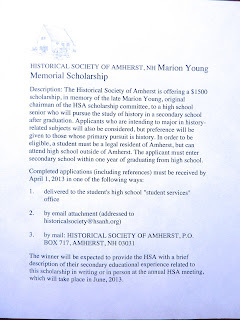 To learn more about our scholarship, click on the document above. 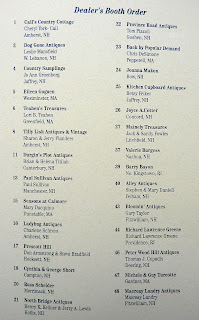 This is the list of antique dealers who helped make our 18th Annual Event such a big success. It's a little difficult to read, but if you click it on it will become considerably larger and easier to read. Would you like to learn more about Amherst, NH, whose history dates to 1760? Then here's a great way to start. Both of these books, and others, are available at the Amherst Historical Society. The Walking Tours of Amherst Village is an 88 page paperback that tells you everything you ever wanted to know about Amherst Village and all of her structures. Amherst Historical Moments, written by Amherst residents Bob Rowe and Bill Veillette, is a 148 page hardback that covers the history of the entire town. Both will make a great addition to your library. 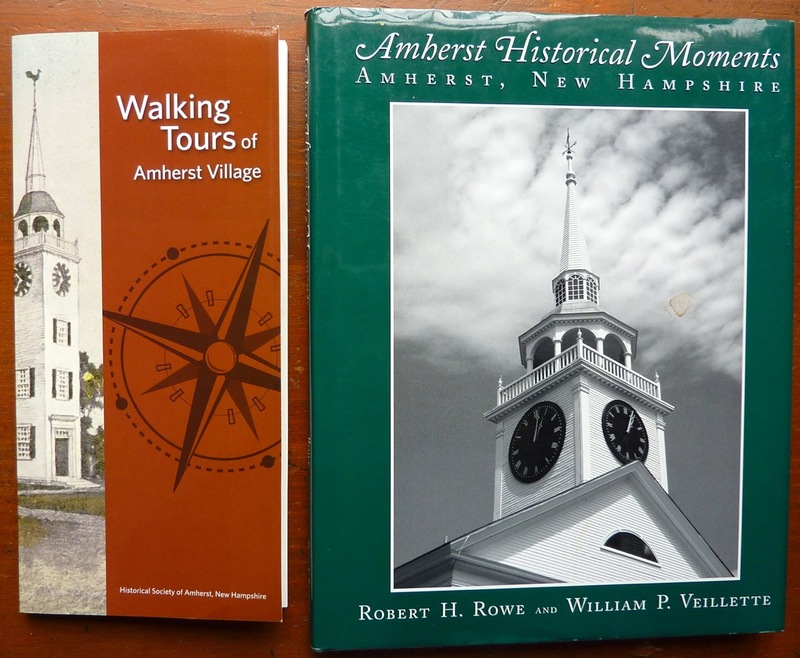 To purchase these titles or learn how to join the historical society, visit the Amherst Historical Society website. 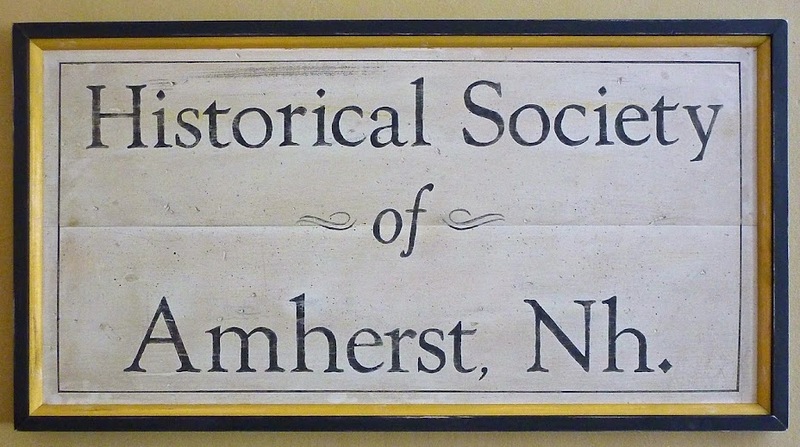 Did you know that the entire Amherst Village Historic District is listed in the National Register of Historic Places Inventory? Click on the REGISTER to learn more about this, but be prepared, it's a large file that downloads quickly but scrolls slowly. 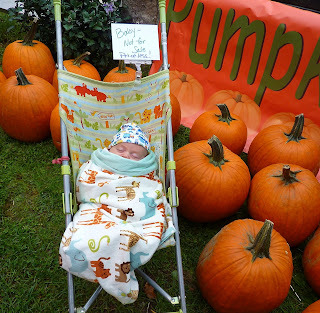 He'll create a blog post, similar to this one, and get the information out.